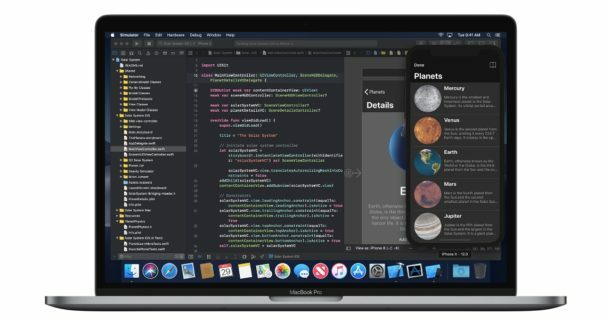 Xcode is the software development suite for Mac that allows developers to build apps for MacOS, iOS, tvOS, and watchOS. The vast majority of developers and Xcode users will download the Xcode application suite from the Mac App Store, but that’s not the only option available to download Xcode, and if you’d rather download Xcode as a DMG or XIP file directly from Apple, then those options are available as well. Additionally, it can be helpful to know how and where to download specific older versions of Xcode, also as .xip or .dmg files. This article will show you where and how to download Xcode from Apple as .xip or .dmg files, as well as from the Mac App Store, and also show you where to download old versions of Xcode from, including direct links to old Xcode versions hosted by Apple. 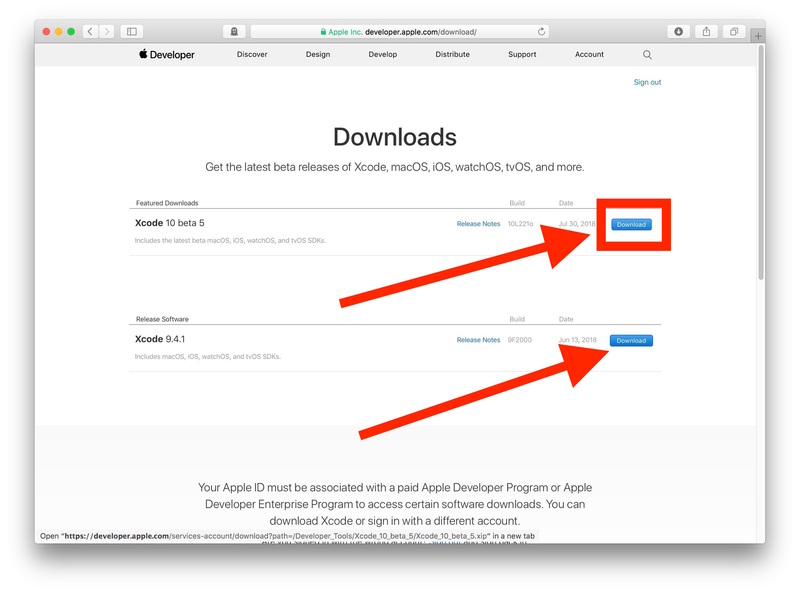 You will need an Apple ID and an Apple Developer account to be able to access these Xcode downloads. The Apple Developer account can be the free level account, it does not need to be a paid level Apple Developer login to simply access the downloads. Downloading Xcode from the Mac App Store will result in the exact same release of Xcode as if you download the latest stable version from Apple Developer downloads page as shown below. If you want to download Xcode as a XIP or DMG file, or if you want to download older versions of Xcode, or even a specific older version of Xcode, you’ll find those links and resources below. Xcode can also be downloaded as a XIP file (.xip extension), and some versions of Xcode can be downloaded as DMG (.dmg disk image file extension) as well. To download Xcode as a .xip or .dmg this way, you must have a valid Apple Developer login, but it does not need to be a paid developer account to simply access the Xcode downloads. If you’re looking for a specific version of Xcode, you can use the download Search tool to locate a particular version release. 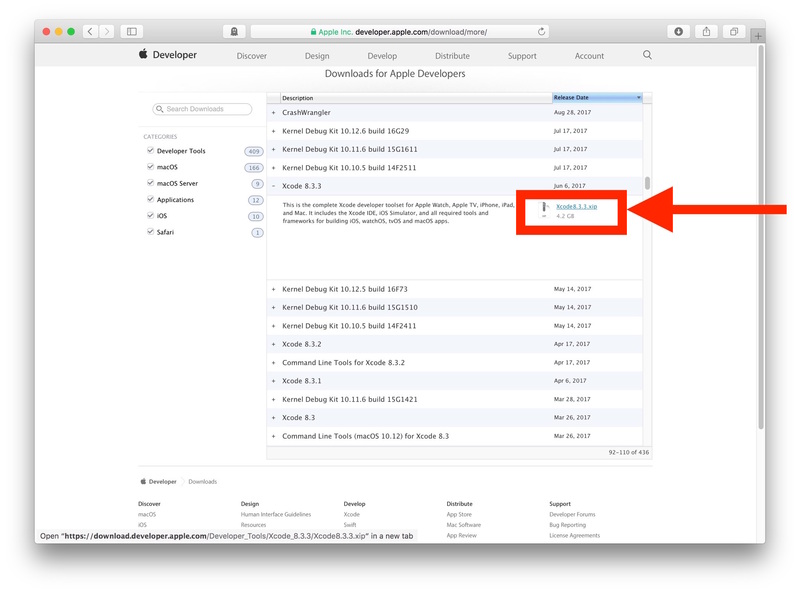 Then simply click on the “[+]” button to expand the information about the release and to access the download, it will be labeled something like “Xcode 7.3.1.dmg” or “Xcode 10.xip” according to the version you are downloading. Most newer versions of Xcode will arrive as a .xip file, which can be opened with Archive Utility in MacOS and Mac OS X. This applies to Xcode 8 and newer. Older versions of Xcode (pre Xcode 8, including all Xcode 7.x releases and before) are available to download as .dmg disk image files, which can be opened directly in the Finder with the Mac OS built-in disk image utility. Apple keeps download links available for basically all versions of Xcode, this is convenient for many reasons, including being able to download an older Xcode version that is compatible with an older Mac OS system software release. Note if you’re downloading some versions of Xcode, you may want to separately install the Mac command line tools package either through the command line, or through the .dmg downloads also available at the official Apple Developer downloads page. The Apple downloads and Apple Developer downloads pages are convenient to track down and access not only older versions of Xcode, but also older updates to MacOS and Mac OS X (including complete downloads of Mac OS X Snow Leopard and Leopard), various security updates, firmware patches, Safari updates, iTunes versions, various versions of other Apple software, and in many cases downloading older Mac software in general. Do you know of any other helpful tips, tricks, or methods of downloading Xcode as a .xip file, a dmg file, or older versions of the Xcode application? Share with us in the comments below!